The social media geekosphere erupted in rage this week when news of the pre-trial sales injunctions against Samsung’s Galaxy Tab 10.1 and the Galaxy Nexus hit the Web. A #boycottapple hashtag emerged as a rallying cry for Android devotees beating their proverbial drums and calling for not-so-proverbial blood. Not because I’m an Apple fanboy (my wife and I both rock Android phones) or because I think the rarely granted pre-trial injunctions are just (they aren’t), but because the #boycottapple types are hating the player, when they should be hating the game. The very patent system that was designed to encourage innovation is instead slowly choking the life out of it. As a publicly traded company, Apple has an obligation to rake in cash for its shareholders, using whatever legal means it can. That obligation manifests in the competitive realm in the form of innovative new products like the various Retina Display-packing gizmos, and in the “anti-competitive” realm in the form of intellectual property litigation. Both are entirely legitimate avenues for propelling yourself ahead of the competition — and Apple isn’t the only company dabbling in either. Patent wars have only grown bloodier in the mobile era. Companies are suing each other all over the globe; Apple’s suing HTC, Apple’s suing Samsung, Samsung’s suing Apple, Nokia says the new Nexus 7 tablet infringes on its patents, everyone who’s anyone is paying Microsoft some sort of licensing fee for using Android, and the Google-owned Motorola Mobility is under legal scrutiny as a possible patent bully in its ongoing litigation with both Apple and Microsoft. I could keep going, but I think you get the idea. Virtually every major technology company is just as guilty as Apple when it comes to aggressive IP litigation. Should software even be patentable? Whether or not software and lines of code should even be patentable is up for debate; in fact, the judge that recently dismissed a major Apple lawsuit against Motorola Mobility says the government should examine that very issue, given the sheer amount of technology needed to power today’s consumer technology. Key figures in the technology world have made similar calls before. Late last year, Mark Cuban called for an abolishment of all software and business process patents. Amazon CEO Jeff Bezos made a similar proclamation way back in 2000, saying that those types of patents should have their lifespan shortened to three to five years rather than the 17 to 20 years of protection currently granted. A Google lawyer summed up a major IP issue in an interview with the San Francisco Chronicle last November: Before the Supreme Court told patent examiners to start using common sense in 2007, pretty much every overly broad idea submitted got slapped with a seal of approval, even if it covered something that most people would find obvious. That’s what’s dragging down innovation. For example, the design patent that earned the Galaxy Tab 10.1 a sales ban is patent D504889, which was granted to Apple in 2005. The diagram above is pretty much the extent of it: a rectangular electronic device with a screen covering most of one face, a power button, and a port. How ridiculous is that? The same obvious, basic design is used by virtually every smartphone and tablet on the market, which means that virtually every manufacturer out there has the threat of litigation looming over its head until 2019, when the Apple patent expires. 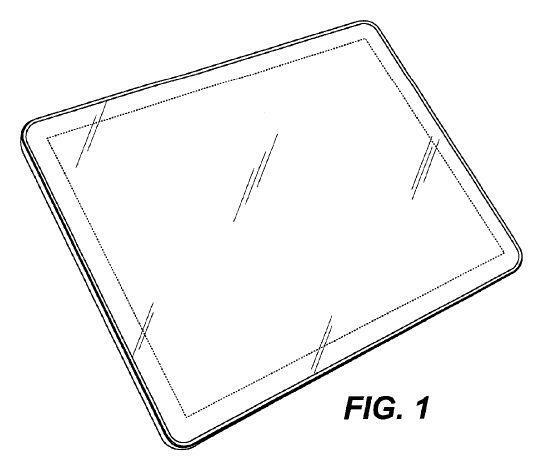 Even though Samsung was able to prove that similar tablet designs were around years before D504889 was granted, a Federal Circuit appeals court recently decided that Apple’s patent is nonetheless valid — hence the sales injunction. Then, there’s patent 5960411. It’s a bit more technical, but here’s what it boils down to: Amazon owns the rights for one-click e-purchases. If you want to sell something online, you either have to integrate additional customer-unfriendly clicks into your interface, or pay Amazon a licensing fee for the privilege of simplicity. The sheer number of ridiculous software patents out there and the riches that come from enforcing them has led to the creation of companies that exist solely to be patent trolls. Patent trolls don’t offer actual products; instead, they hoard patents and other IP and license out “innovation” wholesale. Patent trolls are also particularly lawsuit-happy; a recent study by the Boston University School of law says “non-practicing entities” alone launched 5,842 claims of infringement in 2011, costing the economy a whopping $29 billion in result. Most of the victims were small- to medium-sized businesses. All that being said, Apple deserves the scorn of the masses for one crucial distinction: While most companies launch patent litigation to force lucrative licensing deals, Apple isn’t looking for money. It’s looking for blood. Witness the sales injunction against the Samsung products, the failed injunction attempt against the Motorola Xoom, or the on-again, off-again injunctions of HTC’s various smartphones. Our lawsuit is saying, ‘Google, you f*****g ripped off the iPhone, wholesale ripped us off.’ Grand theft. I will spend my last dying breath if I need to, and I will spend every penny of Apple’s $40 billion in the bank, to right this wrong. I’m going to destroy Android, because it’s a stolen product. I’m willing to go to thermonuclear war on this. They are scared to death, because they know they are guilty. Putting aside moral issues, the patent system as it exists is killing innovation. A 2011 study (PDF) by Catherine Tucker of ETH Zurich found that companies that had been sued by a prominent patent troll then became hesitant to innovate and add new features to their products, leading to lackluster offerings and a massive drop-off in sales. Virtually all of the major consumer technology companies are locked in similar patent litigation in courtrooms around the globe. The very future of technological innovation is in danger if the patent system isn’t overhauled. What, exactly, needs to be done is better left to smarter minds than mine, but there’s no question that something has to be done. Don’t hate the players, folks. Hate the incredibly destructive game.